Home video recording studio setup for vlogging. Blogger making videos with LED ring light panel and smartphone. 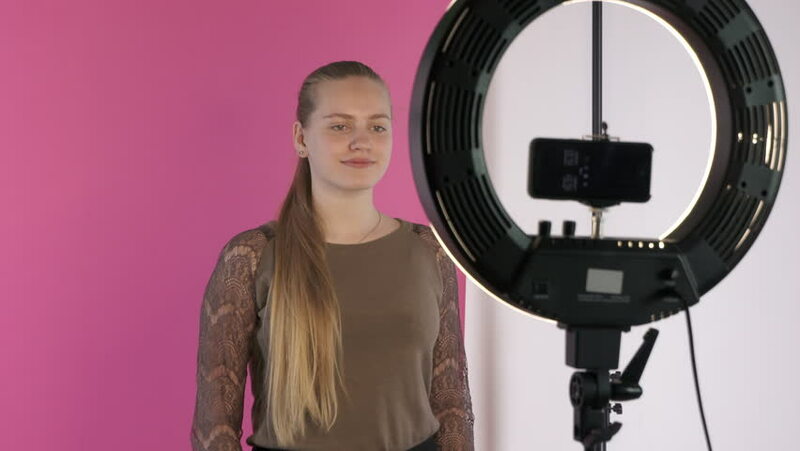 Teenage girl using portable background support system stand and pink paper backdrop. 4k00:25Teen girl vlogger recording video blog for her lifestyle channel in home vlog studio. Teenage blogger using smartphone mounted on ring light panel for vlogging. Happy young girl talking to camera. 4k00:23Home video recording studio setup for vlogging. Blogger using ring light panel, digital mirrorless camera and portable background support system. Teenage girl talking about tools for cleaning braces. 4k00:24Teen girl vlogger recording vlog for her lifestyle channel at home studio. Girl with gift box in hands talking to camera. Using digital camera with external mic on led ring light to record video blog. 4k00:22Teen girl recording vlog for her lifestyle channel talking about braces. Using digital camera with external mic on led ring light to record video blog. Girl shows how to use tools for cleaning braces. 4k00:25Home video recording studio setup. Girl with gift box in front of digital camera making videos for vlog. Teenage girl using background support frame and portable pink paper backdrop for vlogging. 4k00:16Young girl assembles portable background support system with paper backdrop. Home studio set up for vlog video recording. 4k00:14Home video recording studio setup for vlogging. Blogger making videos with LED ring light panel. Teenage girl talking in front of mirrorless digital camera against pink portable paper backdrop.